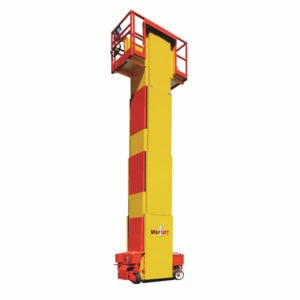 Wolflift | Equipment Rental – Lift Rental | Duke Rentals Inc. The all-electric WolfLift is completely absent of any hydraulics, eliminating the risk of oil leaks on the floor, a tough requirement on an increasing number of work sites. The electric motor functions on the WolfLifT are quieter, more energy efficient, and provide the operator with smoother control of the lift and drive functions. 60" x 32" x 78"